On her 17th birthday, everything will change for Violet Eden. The boy she loves will betray her. Her enemy will save her. She will have to decide just how much she’s willing to sacrifice. 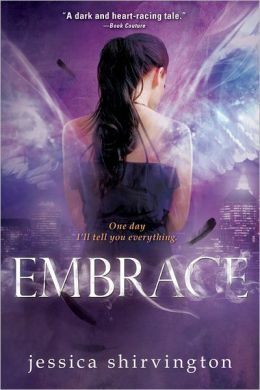 Dangerously exciting and darkly romantic, EMBRACE is a compelling novel of good and evil, seductive desires and impossible choices. A centuries old war between fallen angels and the protectors of humanity chooses a new fighter. It’s a battle Violet doesn’t want, but she lives her life by two rules: don’t run and don’t quit. If angels seek vengeance and humans are the warriors, you could do a lot worse than betting on Violet Eden. LINCOLN: He’s been Violet’s one anchor, her running partner and kickboxing trainer. Only he never told her he’s Grigori—part human, part angel—and that he was training her for an ancient battle between Angels and Exiles. PHOENIX: No one knows where his loyalties lie, yet he’s the only one there to pick up the pieces and protect her after Lincoln’s lies. In a world of dark and light, he is all shades of gray. The wrong choice could cost not only her life, but her eternity. We’re taking on a pretty exciting journey of growing up and discovering yourself with Violet – a 17 year old who is at a crossing point in her life – where she’s being introduced to things that she never could have imagined in life. See, where it all started i suppose was at birth when her mother died, and now she’s at a point where things are becoming clear to her and still quite in the dark on others. Her close friend and potential crush Lincoln is her guide through all of this, for reasons that she doesn’t quite know at the beginning and it’s nice to see that dynamic grow and change. Violet is introduced to parts of herself, the angel sides – the sides with powers that she never expected and is afraid that she now can’t trust anyone and doesn’t always make the right choices. She meets Phoenix and some how allows him to play a role in her embracing what she is and this of course not only has huge implications to her own life and what she’ll become but to her relationship with Lincoln which finally seems like it’s going in a direction that’s not so bad. What i really enjoy about this author is that we get a good sense of the over all story, but we also get a really complicated and anxiety ridden tale of what is right and wrong and what will come of the choices that are made. We get a balance of real and fantasy that we know will carry us through the series too i think. I love that this series is so long winded, meaning that it’s not just a trilogy – there’s more to it, so i hope you guys enjoy it. This entry was posted in Uncategorized and tagged Angels, Embrace, fantasy, Jessica Shirvington, The Violet Eden Chapters by iscm13. Bookmark the permalink. This series changed my life, made me see things in a whole new way. The romance and the betrayal, along with the need to belong makes it a beautiful tale of finding out not just what everyone else needs, but what you need too. I loved it.